Versatility does not have to come at a high price as proven by the Laserscope Gemini laser system. 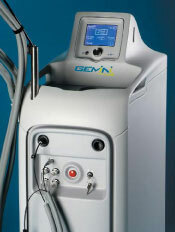 With two wavelengths using a 1064 nm Nd:YAG laser and 532 nm KTP laser, the Gemini system has been cleared by the FDA to perform more than 20 different cosmetic procedures, from acne treatment to hair removal to wrinkle reduction and more. This model also offers 42 spot size options for maximum efficiency and results. You will have a hard time getting more machine for you money than you will with the Laserscope Gemini laser system. At SunrayLaser.com, we have pre-owned Laserscope Gemini laser machines for sale at prices that are as much as 60% or more off the original retail cost. Contact us right now for a no obligation price quote on a quality used Laserscope Gemini laser system.